Is there any custom lighting for QuickFire XTi ?? Trigger z keyboard, led don't work? Multiple unresponsive keys on Rapid-I. I Need advice. Rapid- I - does it have gold-plated connector? 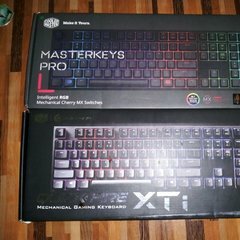 Does coolermaster still allow key switch testers, with the price taken off the keyboard? (Trigger Z) Make the macro to repeatedly hit a key?